If you spend half a day chasing your Schnauzer around the house to just get him in the tub, this article on how to bathe a dog is for you. By following these simple steps, giving your dog a bath will no longer be a chore but instead an enjoyable bonding experience between you and your Miniature Schnauzer. First you will need to decide on where to bathe your dog. If your Miniature Schnauzer is still a puppy, using the kitchen sink is probably the easiest place to bathe him. Once your Schnauzer gets to be bigger, bathing him in a tub or basin will probably be the best choice. Prep Your Dog: Before you bathe your Schnauzer, brush your dog out thoroughly to remove any mats or tangles. If you don't, they will only get worse once they are wet. Next, take a drop of mineral oil onto your index finger and dab a bit at the inner and outer corners of your Schnauzer's eyes. This will help repel the soapy water from this area during his dog bath. If you like, place large cotton balls into your Schnauzer's ears to help keep water from entering the ear canal. Now your Schnauzer is ready for the tub. Dog Bath Tip: One of the biggest mistakes people make when bathing their dogs is not having the water at a good temperature. Making this mistake will have your Schnauzer hating dog baths even more. Get the water warm enough to actually apply onto your Schnauzer. Be sure it's not too hot or too cold by testing it on yourself first. Get Tub & Water Ready: Place the no slip bath mat in the tub. 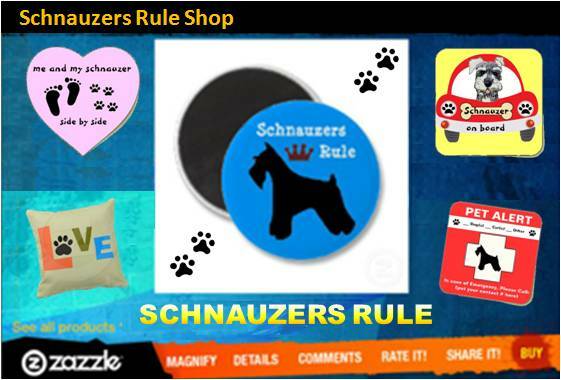 This will help keep your Schnauzer from slipping around and therefore making him feel more secure. If you will be using a pitcher, you will want to fill the tub up with about 5 inches of warm water first. If you will be using a water sprayer this is not necessary. Wash the Body: Now place your Schnauzer in the tub and pour or spray warm water all over your Schnauzer's entire body, except for his face. Going totally against the norm, I prefer to leave the head dry. Most dogs hate to have their faces wet, so saving this area for last makes bath time a breeze. Once your Schnauzer's body is wet apply a bit of dog shampoo into the palm of your hands and rub them together to warm it up a bit. Then apply it to your Schnauzer's back. It's probably better for your dog if you use a natural dog shampoo which will be more gentle on your Schnauzer's coat. Now, using your hands, washcloth, or sponge distribute the soap all over your Schnauzer's upper body and underbelly. I use a soft bristle brush to clean the legs and paws and in between the pads. Dog Bath Tip: During the entire process, be sure to praise your Miniature Schnauzer on how good he is being, using a soft sweet tone in your voice. Rinse the Body: Now rinse your Schnauzer thoroughly. note: if you are using a pitcher and have a tub full of dirty soapy water, be sure to drain it first before rinsing your Schnauzer. If you are going to be using a dog conditioner now is the time to do so. Wash the Face: During this first rinse, go ahead and get your Schnauzer's head wet, too. Now, using a tearless shampoo, soap up a sponge or washcloth and gently stroke over your Schnauzer's head, being careful to avoid the eyes. Rinse him thoroughly one more time from head to tail. You'll want to be sure all the soap is off so it doesn't irritate or dry out his skin. And if need be, you can try these at-home remedies for help in tackling those stubborn dog tear stains. Rinse Thoroughly: When you are finished rinsing your Schnauzer, remove the cotton balls from his ears and let your Schnauzer give himself a good shake-off. Gently squeeze any excess water from his legs and wrap a good towel to soak up most of the remaining water from his body. Dry Your Dog: You may use a blow dryer on cool or on the lowest setting possible to completely finish drying your Miniature Schnauzer. Once your Miniature Schnauzer is completely dry, offer him a really good treat and maybe even take him for a little stroll and show him off! So, your Miniature Schnauzer got a little too close to a skunk and now... Pee-yew. There’s no denying the smell of SKUNK! Woof! You need to get him clean and FAST! Forget using tomato juice... Use this de-skunk dog bath recipe instead before your precious pooch stinks up the whole house! The very first thing to do if your Schnauzer comes inside smelling like skunk is to get him back outside ASAP! He will surly want to get the smell off himself and in doing so roll around your carpet or rub himself all over your furniture. So keep him outside! Now, if you must bring your schnauzer inside to bathe him, put on a pair of rubber gloves and get a large bath towel to wrap around your dog, before picking him up and bringing him in. Take him directly to the the tub and shut the doors to prevent an escape. (note: IF weather permits, it's always best to bathe your dog outside during a deskunking bath). Okay, now apply the soap mixture and begin dog washing. Be careful not to get any of the solution in areas that could cause harm or irritation like the eyes, nose, and mouth. Also be sure to avoid any open wounds as well. 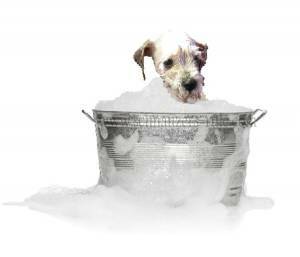 Use the entire soap mixture and continue washing your dog thoroughly all over for no less than 10 minutes. Now rinse your dog thoroughly and get a fresh towel to dry him off. Be sure to throw away the gloves and any other towels or items previously used away. This inexpensive solution works great for those curious pups that always seem to find themselves in a stinky situation.